Jackie Bradley Jr. drives in three runs as Boston beats New York, 5-1. 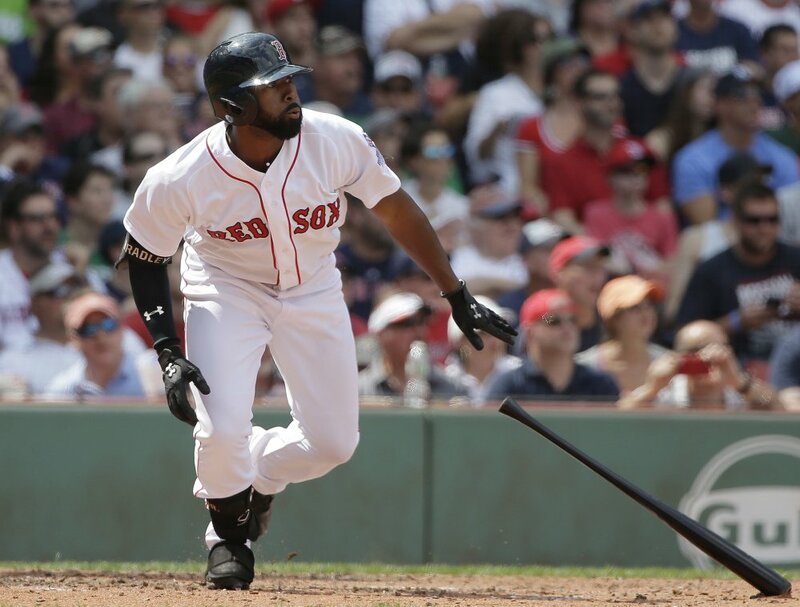 BOSTON — Does Jackie Bradley Jr. consider himself a No. 9 hitter? Bradley produced Sunday afternoon. He knocked in three runs with a triple and a single to lead the Boston Red Sox to a 5-1 win over the New York Yankees at Fenway Park. Sandy Leon’s two-run double in the eighth provided insurance for Boston (71-52). The Red Sox won the weekend series against the Yankees for the second straight weekend and now have a five-game lead over the Yankees (66-57) in the American League East. And maybe the batting order doesn’t matter, when you consider the 7-8-9 hitters – Mitch Moreland, Leon and Bradley – were a combined 6 for 10 with five RBI and three runs. Rick Porcello (8-14) got the win with six innings of three-hit ball. He gave up a Brett Gardiner homer in the fifth. It was Porcello’s fourth straight win. Brandon Workman relieved Porcello and pitched a 1-2-3 seventh. Addison Reed had a 1-2-3 eighth, with a strikeout of Aaron Judge. Craig Kimbrel, in a non-save situation, struck out two in the ninth. Boston beat New York’s newly acquired starter, Sonny Gray (7-8), who lasted five innings, allowing two runs on seven hits and two walks. For the first time in his career, he did not strike out anyone. “The offense was really able to grind their starter down,” said Porcello, whose teammates drove up Gray’s pitch count to 106 pitches. Gray gave up three hits in the second inning – singles by Xander Bogaerts and Leon, and then Bradley’s two-out, two-run triple into the triangle in center field. “I got a 2-0 fastball and was able to handle it,” Bradley said. Adam Warren relieved Gray in the sixth. Moreland lined a one-out single, advanced on a wild pitch and a groundout, and scored on Bradley’s line-drive single to right-center. Leon’s two-run double came off Tommy Kahnle. NOTES: It looks like Drew Pomeranz might make his next scheduled start on Wednesday in Cleveland. Farrell said Pomeranz is feeling better after leaving Friday’s game because of back spasms. He is scheduled to throw a bullpen session Monday. … Farrell juggled the rotation, moving Doug Fister back another day until Tuesday. Eduardo Rodriguez will pitch Monday. … David Price (sore elbow) and Dustin Pedroia (sore knee) will not make the trip to Cleveland. Price’s throwing program has been shut down because of continuing soreness, while Pedroia is hoping to resume baseball activities this week.